I received this book as an advanced e-galley from netgalley.com. It was released on August 21, 2012. Synopsis: Imaginary friend Budo narrates this heartwarming story of love, loyalty, and the power of the imagination-the perfect read for anyone who has ever had a friend . . . real or otherwise. When Mrs. Patterson does the unthinkable and kidnaps Max, it is up to Budo and a team of imaginary friends to save him-and Budo must ultimately decide which is more important: Max's happiness or Budo's very existence. 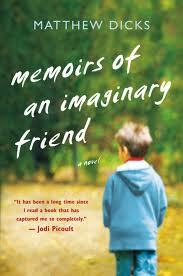 Review: Very original story told in the voice of the imaginary friend. Not only do you learn about Budo and Max but you learn about the lives of imaginary friends and the world in which they live. There are rules to being an imaginary friend. Some can walk through walls, some look human and some don't it really depends on the person who imagined them. Regardless of what they look like all imaginary friends eventually fade away. As their friends get older and don't rely on them or forget about them they start to fade and eventually cease to exist. Most imaginary friends don't really worry about this because they aren't imagined that way but Budo is different. He is smart, can learn, think, travel and worry and Budo is very worried about what happens after Max stops believing in him. He has seen so many imaginary friends just disappear. He equates it to death and constantly worries about when Max will start to forget him. But Max is not a regular boy and he needs Budo's help to get through life, until Mrs. Patterson kidnaps him. Leaving Max on his own and Budo stuck not being able to help. Thoroughly original and engaging this is a very entertaining book. The characters are believable and I really cared about what happened to them. Budo's take on people, their motives and the way they interact with the world really gives you something to think about. What is real and what isn't? I really felt for Budo he may be imaginary but he was very real.